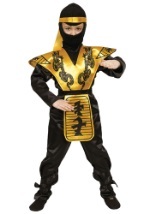 This Child Gold Dragon Ninja Costume can turn you into your favorite video game or anime character! 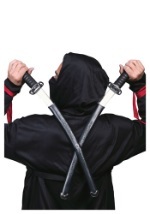 The hooded black jumpsuit is made of 100% polyester interlock knit and fastens with Velcro™ at the back of the neck. 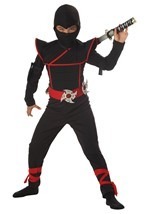 There are molded polyfoam arm and leg guards attached to the jumpsuit, which are black with gold detailing. 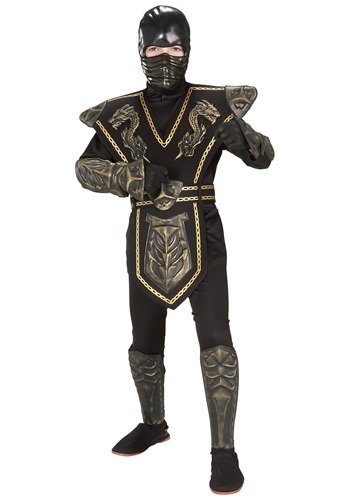 A black foam tabard with gold painted details goes over the jumpsuit. A foam belt runs through two loops on the front of the tabard and fastens with Velcro™ in back. 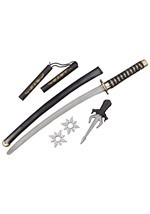 A molded plastic mask is also included, which is black from the nose upward and gold from there down. There is a large opening for the eyes and smaller openings for the nose and mouth. The mask fastens behind the head with a Velcro™ tab on an elastic band. 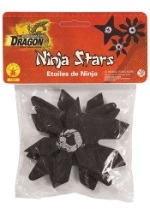 Look for our ninja accessories to add to the fun!